In this haul I got a number of things off my wishlist, am trying out some new skincare, and made a repurchase so let's get to it! I bought this body scrub last summer and fell in love with the scent. It smells like limeade, I am absolutely obsessed with it. I need the sweet, summery scent in the middle of this awful winter. I'm running low on my current tub and there is no other scrub that I want to try now that I've found this. All of my liquid liners seem to be drying out at the same time, so I decided to try out one that is new to me and very highly rated in the blogosphere. 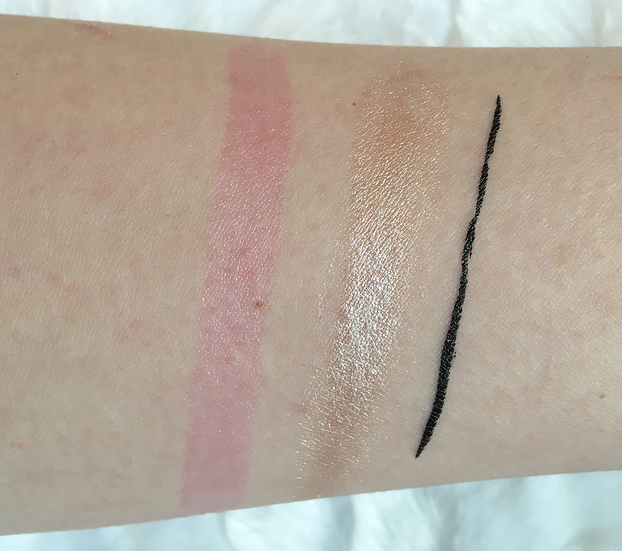 I haven't tried this one on my eyes yet, but based on the swatches you can get a pretty thin line with it and it looks very black. I don't know if it will perform better than my Nyx Epic Ink liner, but I'm willing to give it a try. I have been searching for the perfect cruelty-free micellar water for months and I'm hoping this one is it. It was a little more expensive than the others I've tried, but maybe it's worth it. The coconut scent is thankfully very light, which was a problem I've had with other micellar waters, so if it performs well then it could be a staple in my collection! 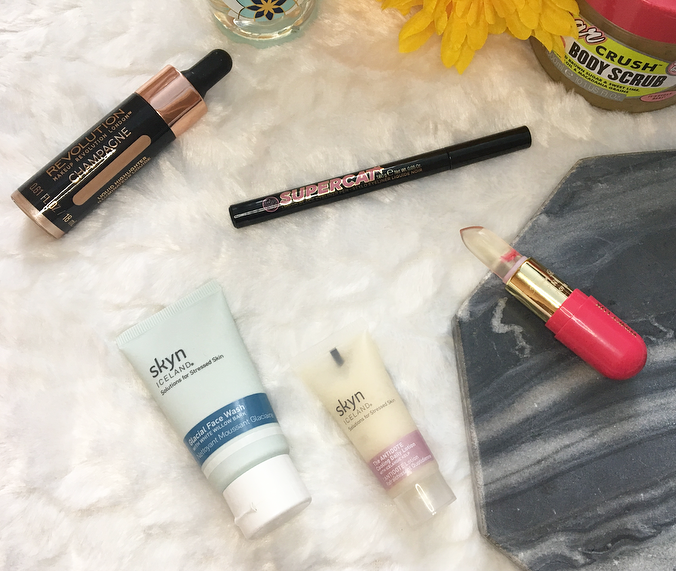 These flower lip balms took the Internet by storm a few months ago, and I always wanted to try one but didn't know which brand to go for. Winky Lux recently began selling at Ulta so I added this clear balm to my cart. 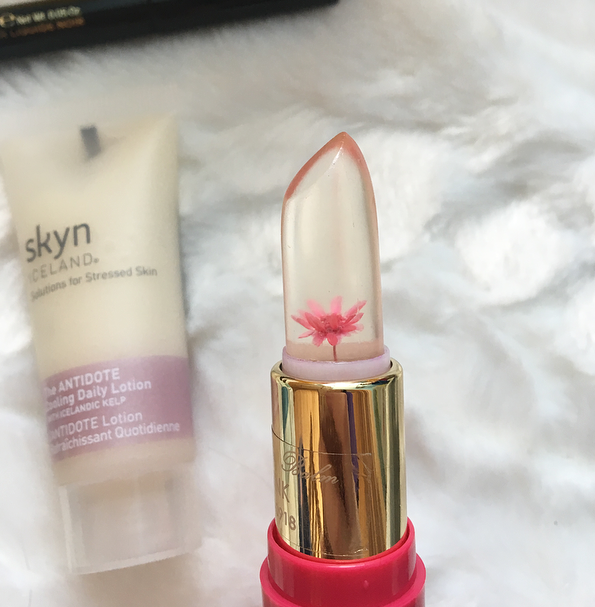 The flower is smaller than I expected, but it is very pretty.The balm applies clear but turns into a light pink shade on my skin tone. In the swatch below the balm was on my skin for about two minutes before I took the photo, and it didn't get much darker after that. It feels really light and moisturizing, so even if it is a gimmicky product it still performs well! This is so beautiful when it is swatched! It seems like a more affordable alternative to the Cover FX liquid highlighters and I can't wait to try it out. Champagne is a light gold that would work for a lot of light and medium skin tones. It's super reflective but blends out to be a little less blinding. My current cleanser from Biore is almost gone so I'm ready to try to find a good alternative, preferably one that is a little less harsh on my dry skin. The Glacial face wash sounded good and I was going to buy the full size, but this sample duo was on sale so I went for it instead! The moisturizer is the perfect size for when I fly to Mexico in a few months, and the cleanser is definitely big enough to see if I want to get the full size. I would love to hear about your recent purchases! 14 comments on "Platinum Ulta Haul"
The Makeup Revolution highlighter is gorgeous, how I missed it when I place my order? Need to get one since they are so affordable! Awesome post. I love Ulta! I’d be curious to try the lip balm. I had no idea that Ulta had a PLatnium Membership, going to need to look into this. Also LOVE that you picked up some Pacifica, they make my favorite mascara! WE don't have Ulta here, but they did start shipping to Canada. Enjoy all your new products. I love the Sugar Crush scrub! I have the body butter, but I miss the scrub. Now you're making me want the body butter haha! I believe this clear lip balms with flowers in side took the beauty world by storm in 2015. Th original was Kailjumei Flower Jelly lipsticks but haven't read much about them anymore. Great haul and even though Ulta is now shipping to Canada, I still haven't place an order.